As promised we are including the links to two radio appearances we made in July. The first is a one-hour interview on KBOO, a Portland radio station. This is an hour long interview and is a very large file. The first fifteen minutes spotlights the Office of the National Nurse initiative. We also were able to join Thom Hartmann on his national Air America program that reaches 3 million listeners. We greatly appreciate having had both these opportunities to let the public know more about the ONN proposal and especially want to thank those who listened in live and wrote to us after the shows aired. On behalf of the Board of NANDA International (formerly, the North American Nursing Diagnosis Association) I am writing in support of the initiative to establish an Office of the National Nurse. NANDA International is the world's premier organization in the field of nursing classification and our volunteers develop, through research programs, terms to describe and classify the unique problems that form the core of nursing practice. Our work is translated into 16 languages and we have a worldwide membership. Our work is used in direct nursing care, in education, leadership, and research. It is used in healthcare IT systems and provides a unique tool to enable nurses to demonstrate the judgments they make in their practice and thus has been shown to improve patient care and safety. As an international organization we are acutely aware that almost every Government health department in the world now has a Chief Nursing Officer (or National Nurse). These roles have made an extraordinary difference in the health of different nations and we believe that the citizens of the United States of America also need to be afforded these benefits. Do you believe the United States should develop an Office of the National Nurse, similar to the Surgeon General? I agree with elevating the CNO to a full time position as the "National Nurse". It is apparent that change is desperately needed. The old way of doing things is not working, our healthcare system is inefficient and costly. Preventable disease rates are climbing, and costs have steadily climbed out of control. Adequate access to quality healthcare has become a luxury that many simply cannot afford. The National Nurse's role in promoting healthy behaviors and teaching prevention can significantly reduce American's dependence on "sick care". Kudos to the NNNO for taking a stand and advocating for patients! Finally... an American health care initiative NOT about someone getting rich! It took a grassroots effort of nurses who care enough about the wellness of our country to finance their own way to Washington DC to engage legislators and others into seeing the benefits of a National Nurse. Prevention is where it's at! A nurse is the better choice to educate the public about prevention. Prevention is rarely in a pill - as the pharmaceutical monopolies and their indoctrinated physicians would have us believe – it's a lifestyle. No special interest gets rich implementing this philosophy. But healthier individuals are more productive and happier – both key ingredients to creating a nation that will lead the world to a better place. Over the last several months, I have thought about a phrase that was once given during a lecture in nursing school. "Pain can be relieved, people can be comforted under your care, but a lifetime of suffering cannot be changed". The statement was encompassing the decisions people make about the future of their health, beyond their stay in the hospital. While this may have truth in today's healthcare system, there is possibility for a different future. I have seen countless healthcare professionals perform health education with patients in the acute care setting. I applaud them for doing this, but it seems as if sometimes the informatiion and guidance is too little, too late. This is an important time for everyone involved in healthcare to consider the bigger picture. What will happen to people if we do not make a conscious effort to improve health education standards? What will happen to people if we do not start encouraging more primary prevention efforts? We have to start somewhere. Opportunities to modify the efficacy of health education are arising. We can reduce suffering. We just need to start thinking about healthcare from other perspectives. One way that we can start is with the endorsement of the National Nurse. The Office of National Nurse provides a wonderful opportunity for ongoing, increased visibility of professional nursing. A focus on prevention, health education and early intervention can increase public awareness of what nurses continue to do, in all areas of health care, to promote a healthy nation. An ongoing positive image of professional nursing can attract more men and women to the profession. Nurses make such a positive difference. How wonderful it would be if we could be more proactive in health issues. This would be a tremendous boost. We need forward-moving thinking at the national nurse level. Many programs are cutting budgets, Americans who simply don't know better are waiting until their health reaches a critical mass and utilizing emergency rooms for their healthcare, and obesity and chronic diseases need constant prevention promotion and education. In addition, schools are packed with students wanting to become nurses; so much so that nursing schools turn away thousands of students. Hospitals see a shortage of nurses and schools cannot hire enough faculty. The poll on this site shows how much support this initiative has. We need more focus on education, disease prevention and preventative care in this country. Otherwise, millions of our tax dollars will keep going towards emergency room visits, chronic preventable diseases and many other health-centric issues. Why wouldn't we spend a small amount to make the CNO full-time in order to prevent disease, educate citizens and care for the healthcare of our nation? 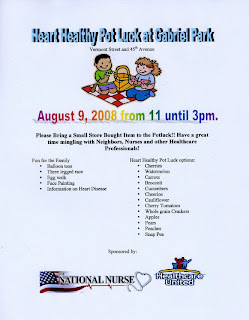 You are invited to join Healthcare United and the National Nursing Network Organization for a potluck picnic at Gabriel Park, located at SW 45th & Vermont Street in Portland, Oregon. The theme of the picnic is "Healthy Heart". We are asking you to choose a healthy snack to share and come prepared to exercise, play games with your children, have fun, and become better educated on ways to keep your and your family's hearts healthy. According to the National Institute of Health, heart disease is the leading cause of the death in America. Over 25% of all deaths are from heart disease. It is also a major cause of disability. The risk of heart disease increases as you age. You have a greater risk of heart disease if you are a man over age 45 or a woman over age 55. You also are at greater risk if you have a close family member who had heart disease at an early age. Know your blood pressure-- 120/80 or lower is normal blood pressure. Get tested for diabetes and if you have it, keep your blood sugar under control. Know your cholesterol and triglyceride levels so that you may aim to keep them normal. Eat lots of fruits and vegetables. The Alliance for Retired Americans is a nonprofit, nonpartisan organization of retired trade union members affiliated with the AFL-CIO. Its predecessor organization was known as the National Council for Senior Citizens. 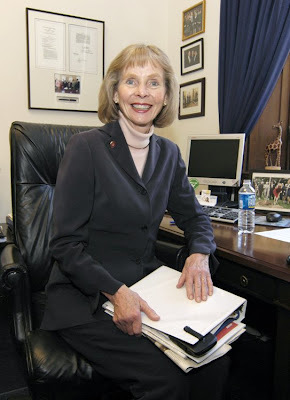 Enclosed please find a Resolution in support of the Office of the National Nurse that was recently passed by the Executive Board of the Oregon Alliance for Retired Americans. The Alliance is an organization of retirees who are committed to activism and want to influence the policies of government that affect all older Americans. In Oregon we represent approximately 30.000 members; nationwide, about three million are Alliance members. We strongly believe that all are entitled to healthcare and the Office of the National Nurse can only add to the depth, breadth, and quality of healthcare in the United States. We believe that establishment of this office is but one pieceof a move to improve our nation's health. Again, we strongly urge the establishment of the Office of the National Nurse.